Credit card payments that have already been processed outside of Boulevard need to be recorded to finalize the transaction and for expense fee tracking. Boulevard can auto-calculate the fees charged for each transaction by entering the fee amount and percentages in Preferences. From the Shortcuts form, click Credit Receivables. Select the check box next to the transaction to be received. From the Credit Receivables tool bar, click the button. From the Credit Receivable Expense form under the Details section, choose the applicable Fee Type from the drop-down list, then click OK to accept and close the form. Please Note: To use the Fee Type and have Boulevard calculate the fee, only one transaction can be selected. 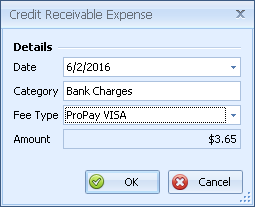 Otherwise if clearing multiple transactions, manually calculate and add the fees that were charged in the Amount field.